Listen to three interviews with Rachel Tzvia Back on Cover to Cover with Jack Foley, 94.1 KPFA Berkeley, CA. She talks about her own poetry as well as her translations of Tuvia Ruebner published in In the Illuminated Dark. Today’s show deals with the Israeli poet and translator (and photographer) Tuvia Ruebner. 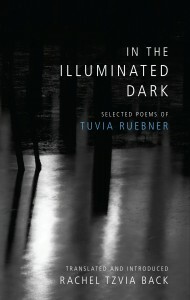 Jack’s guest is American-born Israeli poet Rachel Tzvia Back, translator of In The Illuminated Dark: Selected Poems of Tuvia Ruebner. Rachel Tzvia Back and Jack read selections from In The Illuminated Dark: Selected Poems of Tuvia Ruebner. Selections are read in both Hebrew and English. The poems were translated by Rachel Tzvia Back.